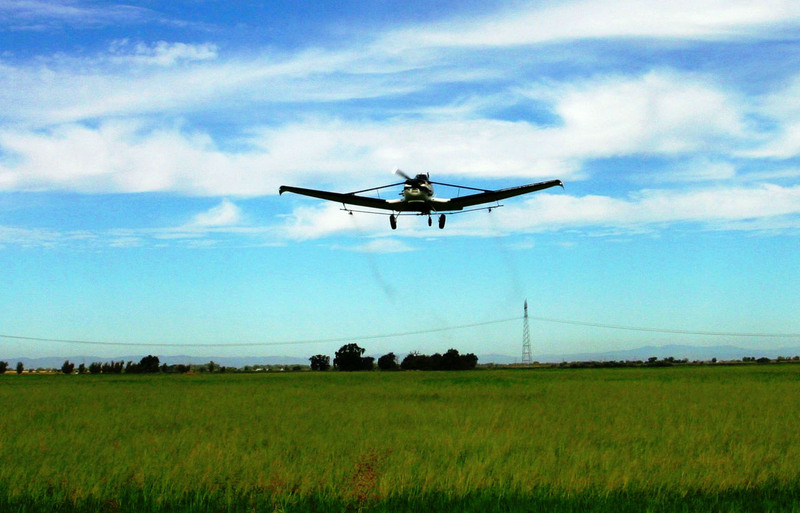 The Sutter-Yuba Mosquito and Vector Control District employs a rice field spraying program to combat two mosquito species common to our counties. Our area farmers produce many thousands of tons of rice annually. Unfortunately, the tens of thousands of acres of seasonally flooded rice fields result in an unfriendly by product- mosquitoes. If some of these mosquitoes can be eliminated in their larval stage, then there will be fewer to bite you. To treat this large acreage quantity, the District contracts with an agricultural crop dusting service. The material used for treating the flooded ground is a product containing Bacillus thuringensis israelensis, also known as Bti. Here is a simple explanation of how it works. After the material is applied, mosquito larvae must ingest some of it. The product consists of Bti spores and a crystalline toxin produced by the bacteria. Inside the mosquito larva, the product causes the gut wall to disintegrate resulting in death to the larva. Bti is target specific. It only produces these effects in mosquito larvae and black fly larvae. Many years of research have shown that it has no harmful effects in humans, animals, plants, fish, or other aquatic organisms, including predators of mosquitoes, even at rates higher than the maximum prescribed label application rates. Extensive testing has shown it is one of the safest insecticides in use today. The District normally treats in excess of 100,000 acres of rice each growing season.